The Desert Rats Association, in support of the 7th Armoured Division Memorial Fund (Registered No. 1063575 under the Charities Act of 1960), is proud to announce that on 6th April 2019, it will be holding a 1940's style Dinner and Dance to commemorate the 75th Anniversary of the D-Day Landings and the Battle of Normandy in 1994, at Lynford Hall, Hotel, Mundford, Norfolk, where the Association has negotiated special room rates for the event. 1940's Theme Dinner and Dance, to commemorate the 75th Anniversary of the D-Day Landings and the Battle of Normandy, in aid of the Charity we support. 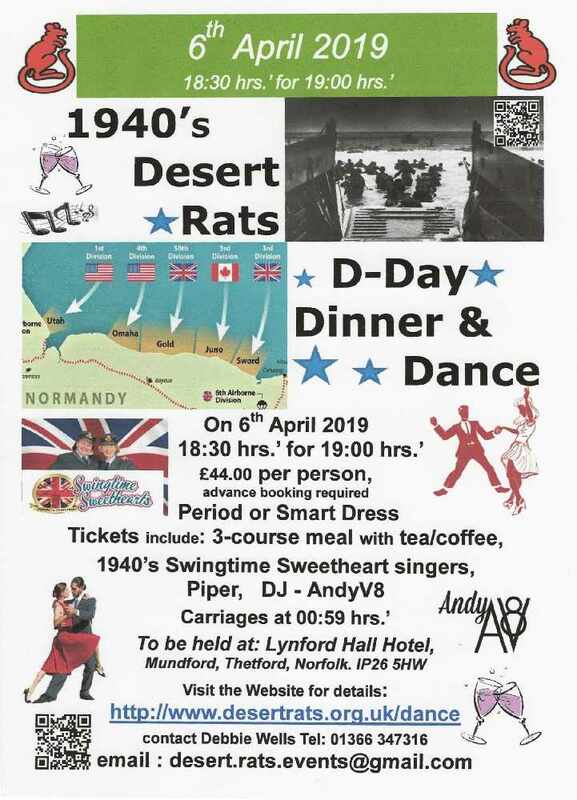 Please come and join us for a 1940's Theme Dinner and Dance to commemorate the links between the famous Desert Rats and Norfolk (which still exist), who were based nearby before sailing for the beaches of Normandy to take part in the momentous events of 1944. You will be able to enjoy the splendour of a wonderful Country House, which was also part of the story of D-Day, itself. •More entertainment and other attractions to be announced. Start time 6.30pm for 7.00pm, with Carriages or Staff Cars at 0.59 am. The event runs from 6:00pm to 1:00am on the following dates.